for Dot Matrix Printers, 3½" x 1-7/16"
Have a large Shipping Project? 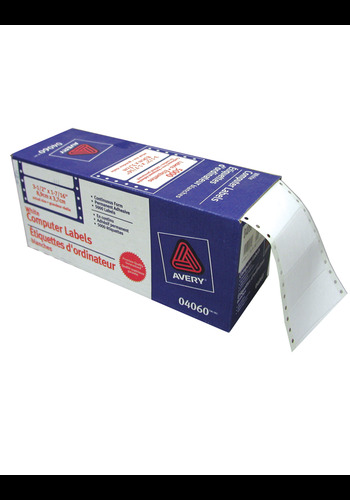 Produce thousands of professional-looking labels without reloading or reprinting. You'll be able to prepare and complete high-volume mailings quickly with Avery® continuous form labels for pin-fed printers. Simply load the Continuous Form Dot Matrix Address labels, customize and print. You'll be able to keep labels printing while labeling all your large mailing projects. Great for shipping, mailing, barcoding, organization and more. Label Size 3½" x 1-7/16"
Labels are designed to smoothly and easily feed through most popular dot-matrix/pin-fed printers to come out looking crisp, professional and ready for your next mailing project.